UNITED NATIONS, USA -- The mother of a Ukrainian helicopter pilot imprisoned in Russia is on a global campaign seeking support from world leaders to pressure President Vladimir Putin to free her daughter. In this March 26, 2015, file photo, Ukrainian jailed military officer Nadezhda Savchenko attends a court hearing in Moscow. 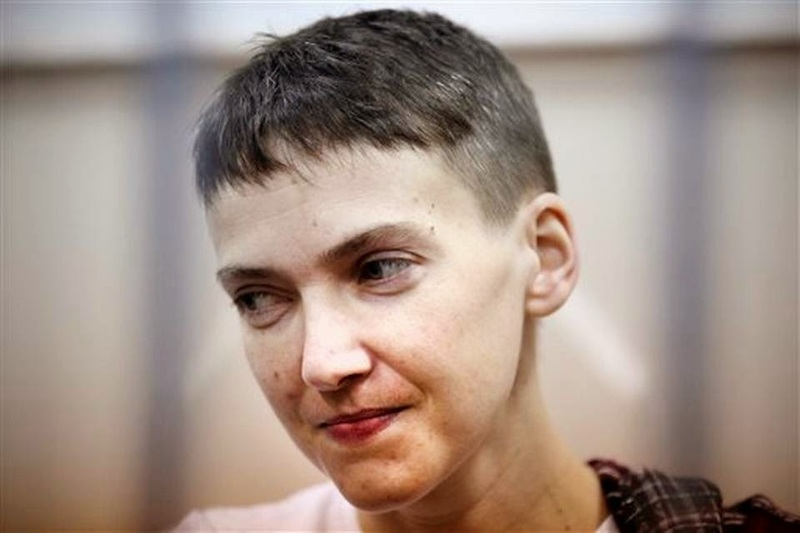 Maria Shavchenko, the mother of a Ukrainian helicopter pilot imprisoned in Russia is on a global campaign seeking support from world leaders to pressure President Vladimir Putin to free her daughter, Nadezhda Savchenko. Nadezhda Savchenko was captured by a pro-Russian militia and has been in Russian custody since June 2014 on charges that she was involved in the attack that killed the two Russian journalists who were covering the war between Ukrainian troops and Russia-backed separatists in eastern Ukraine. At the time of the attack, the 33-year-old pilot was serving with the Aidar volunteer battalion that was fighting alongside government forces near the eastern city of Luhansk. "She is accused of a serious crime as an accomplice in the killing of two Russian journalists." Mrs. Savchenko launched her global campaign in Germany, where she pleaded for help from lawmakers and wrote Chancellor Angela Merkel a letter to help "bring Nadiya back home to Ukraine," using her daughter's Ukrainian name. New York is her second stop and she will meet Tuesday with U.N. Assistant Secretary-General for Human Rights Ivan Simonovic. She attended a rally Sunday near Russia's U.N. Mission where about 100 people signed a petition to presidential candidate Hillary Clinton asking for her assistance to get Nadiya released. She said her next stop will be Paris and then all European countries. "I'm a desperate mother who is ready to travel the globe to make everything possible that my message be heard," said Mrs. Savchenko, who is 78. "I call upon all international leaders to help me to bring my daughter back home." Nadiya spent 83 days on a hunger strike to protest her detention, but under pressure from her family and supporters she started drinking milk and eating cheese in March. Though her weight has dropped from 78 kilograms (172 pounds) to 53 kilograms (117 pounds), her Russian lawyer, Mark Feygin, who saw her last week, said she is in much better physical condition than she was a few months ago. Feygin, who is traveling with Mrs. Savchenko, said Nadiya's preliminary trial has been going on in Moscow and her defense team expects that by the end of the summer the court will present its verdict. He said he has tried unsuccessfully to get the charges against her dropped for lack of evidence, including presenting cellphone records showing "she was kidnapped two hours before the journalists were killed." Since her arrest, Nadiya has been elected as a deputy in Ukraine's Parliament and is a delegate to the Council of Europe, giving her diplomatic immunity, "but everything is ignored by Russian justice," he said.